The Sharkk company is not as well knows as Bose, JBL or UE, but I wanted to see whether the not-so-famous company can deliver a high-quality product. To find out whether this speaker is a good alternative to other more expensive products from well-established brands, I decided to check its sound quality, design, battery and the Bluetooth connection and other features. If you want to learn more about this product, please read the review. 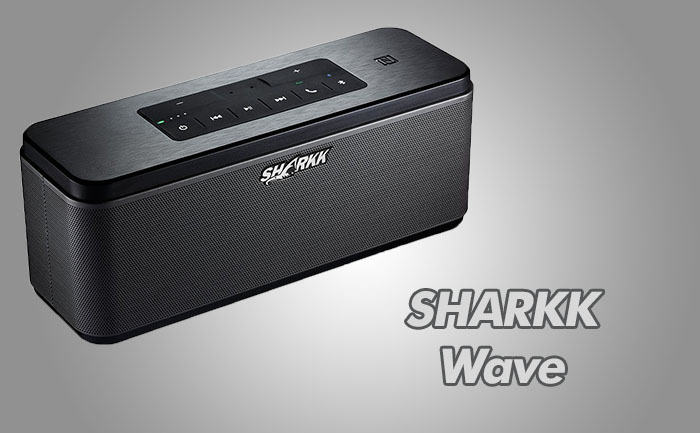 The Sharkk speaker weighs 2.8 pounds (1270 grams) and measures 8.5 x 3 x 3.5 inches (216 mm x 76 mm x 88 mm). Besides that, you can find LED power/charging indicator and the NFC functionality. The speaker is equipped with a thermal sensor – just move your hand over the speaker to turn on the LEDs for a few seconds, so you will be able to see the buttons in the low light environment. Along with these functionalities, speaker allows you to connect to your personal assistants, such as Siri or S-Voice, and start asking questions. This device also allows you to answer phone calls. When a person calls, the speaker announces a call and the music becomes silent. When the caller hangs up the music starts to play again. This works great on both ends of the conversation. Sharkk has two 58 millimeter drivers rated at 12.5 watts each. The speaker is great when it comes to sound quality and can deliver enough sound for a small party. I must say that the bass can be punchy and music from Skrillex sound better than expected. I also haven’t noticed any problems when it comes to treble – you can listen to classical music, and the sound offers great clarity and crispiness. No matter what types of music you like, it performs well. The speaker sounds better than other more expensive speakers I own. Don’t get discouraged because the speaker is “off brand”. For the price, this sound is unbeatable. This wireless speaker uses the Bluetooth 4.0 connection and the NFC feature. This feature is well known for Android users and offers the almost instant pairing of two devices – just tap the speaker with your phone and you are connected in no time. If you don’t want to connect your phone to the speaker wirelessly, you can connect it with a wire. After you plug in the auxiliary cable, the speaker automatically disconnects Bluetooth and goes into the auxiliary mode. The next great feature that is rarely met in Bluetooth speakers, is a docking station. There are two pins on the cradle that correspond to the holes in the bottom of the speaker, so it makes it easy to line up. There are also two metal connections in the speaker that connect to two pins. When you put the speaker on top of the base, the charging process begins. If the battery is fully charged you can get 12 hours of play at 50% of volume level. This power is delivered by three batteries rated at 2,250 mAh combined. 1 red LEDs means that the battery is low. Note that it comes with a wall charger, but if you want the docking cradle you have to buy it separately. PROS: Price / Docking cradle / Good sound / NFC feature / Multiple dedicated buttons. CONS: The cradle is sold separately.